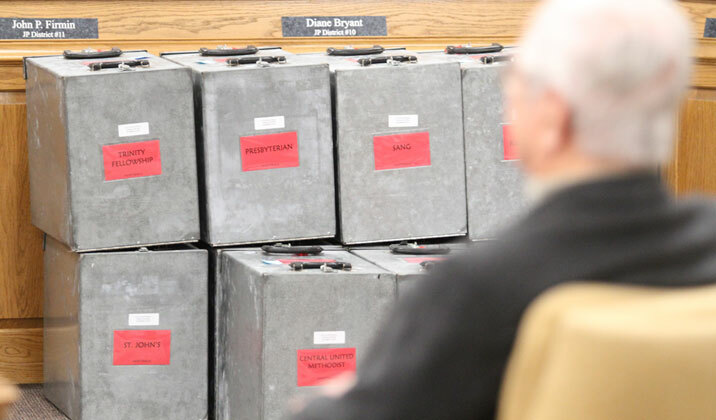 Peter Loris, chair of the Washington County Election Commission, watches as volunteers count ballots Tuesday night inside the Washington County Courthouse. Fayetteville voters repealed a contentious new civil rights law on Tuesday. Final unofficial results showed 7,523 votes (52 percent) for repeal and 7,040 votes (48 percent) against repeal. 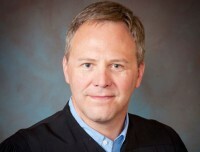 The decision came during a special election called by petitioners who sought to repeal the new ordinance, which prohibits business owners and landlords from unjustly firing or evicting someone because of their sexual orientation, gender identity, socioeconomic background, marital status, or veteran status. The law was passed by the Fayetteville City Council on Aug. 20, but a group called Repeal 119 turned in enough signatures to put the ordinance on hold and force the special election. According to the Human Rights Campaign, at least 200 cities and counties across the country have passed anti-discrimination ordinances that offer protections based on sexual orientation or gender identity, including Atlanta, Boston, Chicago, Dallas, Denver, Houston, New Orleans, Kansas City, Seattle and St. Louis. Smaller cities with similar laws include Springfield, Missouri; Starkville, Mississippi; Lawrence, Kansas; and Shreveport, Louisiana. Fayetteville voters successfully repealed a similar civil rights law in 1998 that would have prohibited the city from discriminating against homosexuals when hiring or firing city employees. The council first approved the ordinance, known as the Human Dignity Resolution. Then-Mayor Fred Hanna vetoed the proposal, but two weeks later, the council overturned Hanna’s veto. A group called Citizens Aware collected enough signatures to put the proposal on the Nov. 3, 1998 ballot where it was repealed, 58 percent to 42 percent. For more on the history of the civil rights ordinance, including a summary of common arguments, see our guide to Understanding the Dec. 9 civil rights special election.